Having to permanently wear dark trousers. I seem to have a habit of wearing my pale blue jeans when I’m playing a lot…why’s this a problem? Well, when the inevitable spit ends up on your knees, dark jeans conceal it. Light ones, needless to say, don’t. Yeuch. Flicking spit onto the music. (I swear these aren’t all spit-themed…) Yes, this has happened before, and yes, using the music afterwards is as gross as you think. Volume. The ability of trumpets to be LOUD is good in ways, but also means there’s nowhere to hide. When you screw that bit up or split that high note, people are gonna know about it, unfortunately. 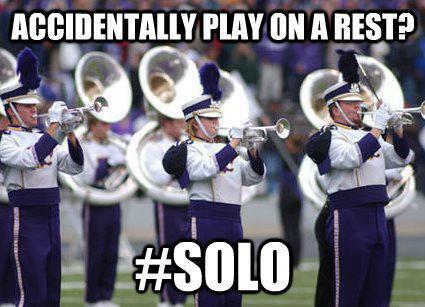 (Not that this ever happens, because obviously we’re just the best musicians around). Trying to play standing up. Three words: Can’t. Read. Music. Trumpet hygiene. Never quite knowing if that weird red stuff inside the mouthpiece you haven’t used for years is a trick of the light, or some obscure kind of red mould. Cleaning the trumpet and having weird black liquid splash you in the face. I WAS ONLY TRYING TO LOVE AND CARE FOR YOU, TRUMPET, WHY DID YOU HAVE TO CHUCK BLACK STUFF AT ME BLECH. Do you play any instruments? What are the hazards and related issues you come across? 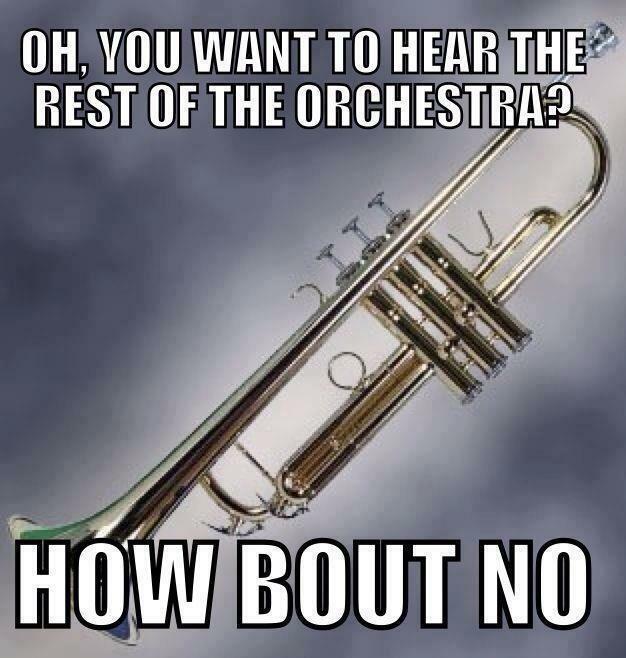 Obviously I don’t have first-hand experience of playing the trumpet, but this was hilarious! It is pretty….but whoa. No problem!